An abundance of biodiesel activities at ASTM may make 2016 the busiest year yet at the organization, said National Biodiesel Board senior technical advisor Steve Howell, who detailed ongoing and future technical work to expand biodiesel markets. German biodiesel exports from January through November 2015 were down almost a quarter from the same period in 2014. The sharp drop in exports was first and foremost based on a massive decline in deliveries to the Netherlands, France and Poland. NREL's Robert McCormick presented results at the 2016 National Biodiesel Conference from a recent study on biodiesel stability in high-pressure common rail (HPCR) fuel systems for diesel engines. The results show current standards are adequate. New York City has been a trailblazer in its approach to improving air quality. The city blends biodiesel with standard heating oil to create Bioheat for its buildings. A group of Minnesota soybean farmers recently toured NYC to see Bioheat in action. Renewable Energy Group announced Feb. 3 that it has signed an asset purchase agreement with Sanimax Energy LLC to acquire Sanimax's 20 MMgy nameplate capacity biodiesel refinery located in DeForest, Wisconsin. This is REG's 11th active U.S. plant. Ensyn Corp. announced it has been granted key regulatory approvals by California Air Resources Board pursuant to the LCFS on the company's application for its renewable fuel oil (RFO) to be used in coprocessing by California oil refineries. Landmark climate efforts, heavy-duty vehicle market dominance and lifetime careers dedicated to the advancement of biodiesel were all honored by the Nat'l Biodiesel Board late January during the National Biodiesel Conference & Expo in Tampa, Florida. Tamoil has begun selling arctic diesel containing a minimum of 20 percent Neste renewable diesel to its corporate customers in the northern Italian Alps region. 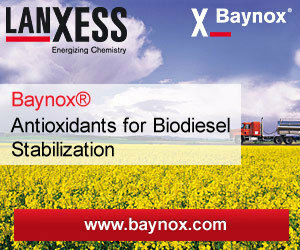 The product is marketed as Gasolio Artico Tamoil - New Generation Diesel fuel. In a twist of geometry, an oval can make a line. The new algae raceway testing facility at Sandia National Laboratories may be oval in shape, but it paves a direct path between laboratory research and solving the demand for clean energy. Published in Energy and Environmental Science, the new method developed by University of Melbourne researchers purifies CO2 in power station flue gases by absorbing it into a liquid. This liquid is then pumped through hollow fiber membranes. The widely attended fan festivals and transportation to the NFL championship football game in San Francisco Feb. 7 are the latest in a long line of entities to recognize advanced biofuels in meeting climate, clean air and sustainability goals.